New Delhi, Mar 14: In another incident of wardrobe malfunction, a German model was left with a red face after her outfit slipped off showing her assets. The slip off happened with a German model walking the ramp in designer Rajesh Pratap Singh's collection at the on-going Wills Lifestyle India fashion week. 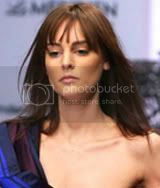 As this German model walked the ramp in blue out-fit, it's left shoulder strap slipped off revealing her assets. The model of course just slipped it back and kept walking with composure. In 2006, Carol Gracias' halter neck top came off while she was walking the ramp in a Bennu Sehgall dress. Further, former Miss India Gauhar Khan's skirt also got unzipped while she was displaying an outfit by Lascelles Symons. Actress Nigar Khan's top slipped at a Norway fashion event making headlines in nearly all newspapers.